The stalking and killing of animals, which probably began during the Ice Age when plant food became scarce, has become a form of recreation; it is rarely necessary for human survival. Less than seven percent of the U.S. population hunts. 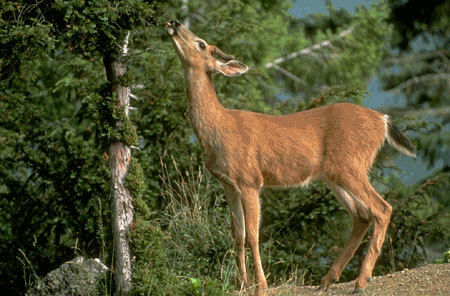 Hunting is permitted on 60 percent of U.S. wildlife refuges and in many national forests and state parks. Forty-five percent of hunters do their killing on public lands. On federal land alone (more than half a billion acres), more than 200 million animals are killed every year. It is illogical that hunters are allowed to kill and maim animals who theoretically "belong" equally to the 93 percent of Americans who don't hunt. But because the state wildlife commissions and federal agencies that regulate hunting are now run by hunters, they perpetuate hunting year after year, regardless of the ecological damage it causes or the objections of nonhunters. Powerful hunting lobbies in 35 states have persuaded lawmakers to enact "hunter harassment" laws that make it illegal for nonhunters to interfere in behalf of animals targeted by hunters, but these laws are being challenged on constitutional grounds. Connecticut's law was found to impact on freedom of speech without a compelling state interest and was struck down by a U.S. appeals court. "Wildlife management" and "conservation" are euphemisms used to describe programs that ensure that there are always enough animals for hunters to hunt. Every year tax dollars are spent to burn, bulldoze, and otherwise manipulate the environment to support the feeding and breeding of "game" animals, at the expense of the variety of species who share that habitat. exterminating predators like wolves and mountain lions in order to throw prey populations off balance, thereby "justifying" the killing of both "dangerous" and "surplus" animals. The ecosystem and food chain form a complex web of interdependencies that, if left alone, provide for the survival of most species. Natural predators help themselves and their prey species to survive by killing only the sickest and weakest animals. 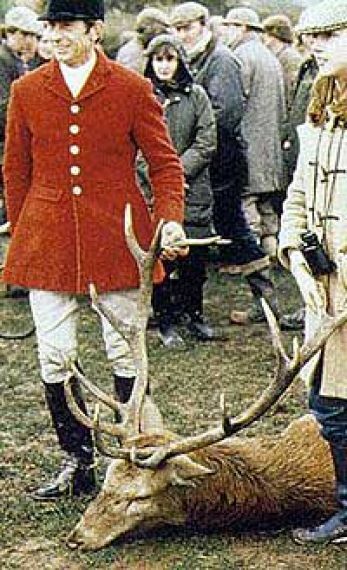 Hunters, however, kill any animal that they come across or any animal that would look best mounted above the fireplace - often the large, healthy animals needed to keep the population strong. In fact, hunting creates ideal conditions for accelerated reproduction. The abrupt drop in population leads to less competition among survivors, resulting in a higher birth rate. Even if an unusual disaster caused an animal population to temporarily overpopulate, the group would soon stabilize through natural processes. Starvation and disease are unfortunate, but they are nature's way of ensuring that the strong survive. Shooting an animal because he or she might starve or might get sick is arbitrary and destructive; the healthiest animals find a way to survive and maintain the strength of the entire herd or group. The stress that hunting inflicts on animals--the noise, the fear, and the constant chase - severely restricts their ability to eat adequately and store the fat and energy they need to survive the winter. Hunting also disrupts migration and hibernation, and the campfires, recreational vehicles, trash, and other hunting side effects endanger both wildlife and the environment. For animals like wolves who mate for life and have close-knit family units, hunting can severely harm entire communities. Rampant poaching for "trophy" animals and commercial gain is squeezing vulnerable populations. Hunters claim that they pay for "conservation" by buying hunting licenses, duck stamps, etc. But the relatively small amount each hunter pays does not cover the cost of hunting programs or game warden salaries. The public lands many hunters use are supported by taxpayers. U.S. Fish and Wildlife Service programs, which benefit hunters, get most of their funds from general tax revenues, not hunting fees. Funds benefitting "nongame" species are scarce. Hunters kill more animals than recorded tallies indicate. 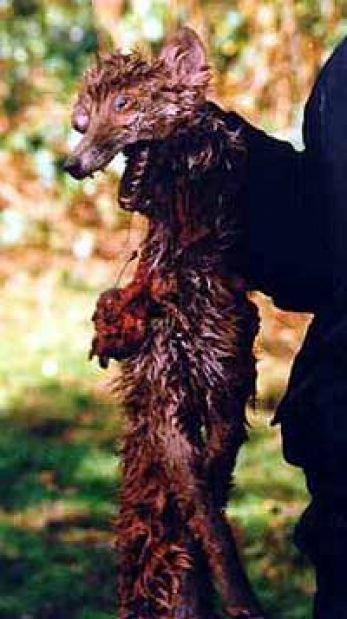 It is estimated that, for every animal a hunter kills and recovers, at least two wounded but unrecovered animals die slowly and painfully of blood loss, infection, or starvation. Those who don't die often suffer from disabling injuries. Because of carelessness or the effects of alcohol, scores of horses, cows, dogs, cats, hikers, and others are wounded or killed each year by hunters. In 1988, 177 people were killed and 1,719 injured by hunters while walking through the woods or on their own property. Before you support a "wildlife" or "conservation" group, ask if it supports hunting. Such groups as the National Wildlife Federation, the National Audubon Society, the Sierra Club, the Izaak Walton League, the Wilderness Society, World Wildlife Fund, and many others are pro-hunting. 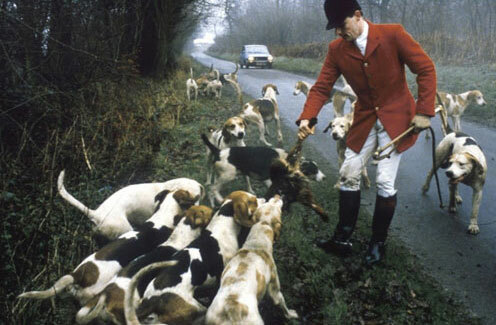 To combat hunting in your area, post "No Hunting" signs on your land, join or form a local anti-hunting organization, protest organized hunts, play loud radios and spread deer repellent or human hair (from barber shops) near hunting areas. Report poachers in national parks to the National Parks and Conservation Association. Tell others the facts about hunting. Encourage your legislators to enact or enforce wildlife protection laws, and insist that nonhunters be equally represented on wildlife agency staffs.